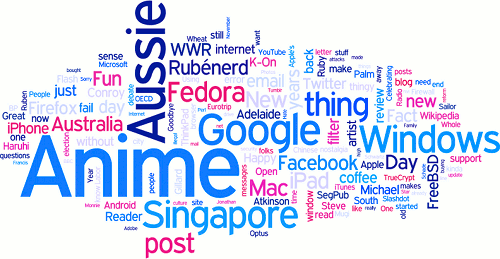 At the end of each year, I like to make a Wordle out of all the post headings. And this year I'm adding other stuff too, all of which is entirely pointless and not worth reading. Like a phonebook in 2010. Hey, see what I did there? Certainly only judging what I talked about from just the heading doesn't take into account the length or quality of the posts, but still interesting nonetheless. Apparently I talked a lot about anime this year, which is surprising because I really didn't think I did! And for someone who only uses the OS in a virtual machine on his Mac and *nix machines, I sure talked about Windows a lot ;). I guess its no surprise I mentioned Singapore and Australia in a lot of entries. And finally, while not a huge topic, Whole Wheat Radio (WWR) will never be mentioned that much ever again owing to the site's closure. I don't know why, but I never really got what the big deal about new years was. In our current accepted calendar system, its just the passing of one unit of time and the beginning of another! Still, here's a look back at 2010. University, work, finances, health, extended family woes. I won't depress us by dwelling on them. Suffice to say, here's looking at 2011 for a reprieve from all that! Each day this year, I was offered the privilege of waking up. That is big deal, and one I think we don't often appreciate. In January we circumnavigated Ireland, travelled through southern Germany, Austria, the Czech Republic and ushered in the new year in Paris. It was during the 2009/10 Europe blizzard that grounded all the planes, but it was a novelty to us with all this snow business that we never see otherwise. Possibly the best holiday of my life. After a sudden change in our finances, my sister, old man and I moved back in together in Sydney after living in Singapore on and off since the mid 1990s. None of us wanted to leave, but Sydney has turned out surprisingly well for us. I think I'm going to be enjoying our few years here, which is a relief :). After using a 2006 MacBook Pro as my production machine for four years, I finally got a brand new refurbished Mac Pro. Its big, beautiful, let me dismantle my ugly Stonehenge of external hard drives, has almost triple the memory, and its super fast. Hey, I spend me life on these machines, so this was a big deal! Medical insurance stuff finally started swinging our way, even if other financial stuff didn't. And finally, something else that's very confusing but I'm still glad and feel extraordinarily lucky that it happened. Happy New Year, if you're into that sort of stuff. Personally I don't know why we're celebrating, the year of the rabbit doesn't start until February.